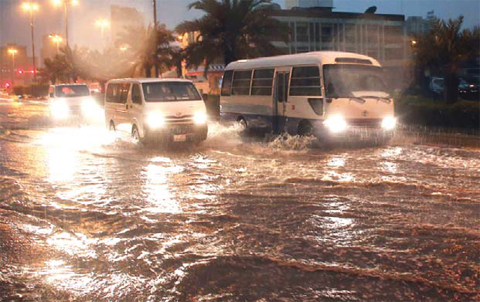 KUWAIT: The Ministry of Interior urged motorists to be cautious due to heavy rains. In a press statement yesterday, the ministry’s department of public relations advised the public to use hotline (112) in case of emergency. Meanwhile, emergency teams from the Ministry of Public Works are deployed in all six governorates to deal with urgent incidents that may be caused by rain fall and unstable weather conditions, ministry spokesman said yesterday. Abdulmohsen Al-Enezi, also Assistant Undersecretary for Planning and Development, told KUNA in a statement the ministry was coordinating with the Ministry of Interior, Civil Defense Department and Meteorological department to deal with any emergency case. He said the emergency teams were monitoring the situation in the streets. Authorities in war-hit Yemen and in Oman yesterday urged residents to evacuate coastal areas as a severe cyclone brewing in the Arabian Sea approached the shores. The UN’s weather agency said on Friday that the “super cyclonic storm” named Chapala was expected to make landfall around midnight Monday in Yemen and Oman. Yemen’s meteorological agency called on residents of the southeastern provinces of Hadramawt and Mohrah, and the island of Socotra, to stay at least one kilometer away from the shores. It said activities at ports and airports in coastal areas should stop when the cyclone hits, and urged fishermen to stay on land and to lift their boats out of water to avoid losses. To the east, Omani authorities ordered that schools be closed today and tomorrow in the southwestern province of Dhofar, ONA state news agency said, adding that medical and diving teams had been sent there in preparation for the storm. Satellite images have shown that Chapala was approaching the shores with wind speeds between 220 and 250 kilometers (136 and 155 miles) per hour, ONA said. Oman’s civil aviation authority warned that waves higher than seven metres (23 feet) were expected to hit the beaches of Dhofar.